DUE TO FORD’S sensitivity over the association of its name with that of other manufacturers, the car the world has come to know as the Lotus Cortina (one of the classics of the 1960s) was christened the ‘Ford Consul Cortina Developed by Lotus’. Through his innovative manufacturing methods Henry Ford achieved his aim of popularising the motor car, but this was gained at a serious cost to the image of his company’s products. Certainly Ford held little appeal for the motor sporting fraternity. As part of Ford’s campaign to improve its image and attract a part of the car-buying public that it had previously neglected, Ford decided to enter motor sport. One way the company did this was to sponsor rally competitors and later to run teams. In the early 1960s production saloon car racing was a very popular part of the sport and attracted teams from many manufacturers. At this stage Ford had not gone beyond sponsorship of private entrants driving their own cars, but by 1962 was ready to enter in a more serious way. After the company’s usual extensive research, the particular sector identified was the class for series production saloons, the international ‘Appendix C’. Saloon cars were raced in three classes – standard, modified and no holds barred. The first class allowed virtually no modifications to the vehicles and consequently attracted very little interest. In the second class, limited modifications were permitted so that the cars seen racing really were quite close to those that the spectators could buy. The final class allowed (almost) any modification and was contested by such animals as Jaguar-engined Minis -not an appropriate class for serious manufacturers to promote their products. Ford opted for the middle classification of racing. It was then a matter of considering the car model range and the engine size which best sparked the public interest. To go into the small car class was out of the question since Ford had no Mini-sized car. In the three litre class Ford could have entered with the Zephyr range, but this range was not attracting much international interest and in any case these cars were not normally significantly faster than the best of the big-engined Anglias, and were unlikely to be able to match the Jaguars. Having thus settled on the modified 1.5 to 2 litre class, Ford then had to choose its manner of attack. As we now know, the company chose to collaborate with Lotus. The Lotus Cortina was conceived roughly as a Cortina made to run in the ‘no holds barred’ class, but manufactured in sufficient quantity as to qualify as a production car in its own right. When Chapman had determined the specification of the ‘ultimate’ racing Cortina it then had to be de-modified by the right amount to ensure that in its fully modified form it would come in the so-called ameliorated class. 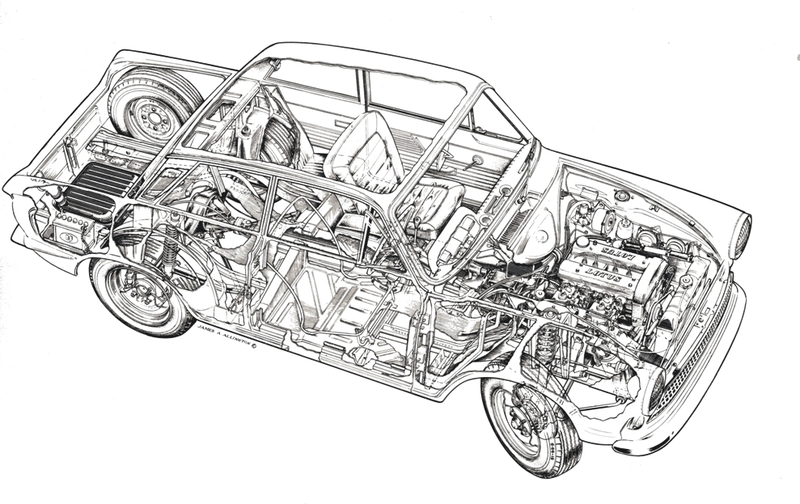 Production Lotus Cortinas were to be pitched at such a level that with the permitted modifications of Appendix C of the International Sporting Code they became ‘Cortinas with unlimited modifications’. In other words, Production Lotus Cortina equals freely modified Production Cortina. A company like Ford is very methodical in its approach to any new product. Each product on which work is done (even if it never reaches production) is defined at its outset by a series of Product Letters giving its market objectives. These continue through the development of the product and beyond, refining the specification as it matures. The Lotus Cortina started life as boldly as one might wish. Some wag at Ford established the series of Product Letters for the Lotus Cortina by publishing the first one under the reference HM 1 (HM – hairy motors). From this beginning was born the car which has since made its place in motor sport history. Initial negotiations were carried out confidentially, but once the project was started, meetings were held between the two companies involving widening circles of people. There were also a series of visits to each other’s factories and engineering departments. Some doubt was cast in the minds of the Ford engineers, used to seeing several hundred engineers and draughtsmen in their engineering centre, to see the Lotus drawing office with a total of eight! At the time Lotus had only a small development shop which served for almost all prototype manufacture. This shop was well equipped for making racing cars but not for handling a passenger saloon. There was no lift for raising the car for work on the underside. Racing cars were light enough to be lifted by two or three people onto trestles when needed, or at most using an engine crane. The method of working was that Chapman, who had had drawings of the car some time before, produced schemes outlining the suspension geometry, driver seating positions etc., as he envisaged them. These drawings, which Chapman produced precisely to scale and incredibly neatly, contained all the keys to the Chapman ideas to be incorporated in the design. It was this type of drawing that he always used to pass his guidelines to his design team. The drawings would be accompanied by notes in his fine hand writing. In the case of the Lotus Cortina many of these notes had already been passed to Ford before the project started. They included the requirement for aluminium body and gearbox parts and diff housing. Without Ford’s undertaking to provide these, Chapman would have been most reluctant to undertake the task. Remember that he was in effect promising to produce a world beater. To do this he demanded that it should be just as he specified. It must be remembered that this product was not a Chapman design and that most of the detail work was undertaken by others. However, the Chapman vision was very much in evidence. He manipulated the early negotiations with Ford in such a way that he could specify the car to fulfil the original requirements while at the same time so surpassing the minimum necessary that the product became a classic. The most noticeable of these changes were the use of aluminium for the bonnet, boot and door pressings and for the clutch housing, gearbox extension and diff castings. Although, when Chapman originally asked for these changes the Ford senior management had agreed them, when the engineers from the Aveley Engineering Centre came to carry them out they quite naturally questioned the costs involved. To do things ‘correctly’ the tools made for forming these parts should have been remade to suit the different material. In a press tool, in which body panels are made, the shape of the tool differs from the shape of the finished panel to allow for the spring-back of the material after forming. Sheet aluminium has a different springiness from sheet steel and theoretically demands new press tools. Similarly, since casting tools differ in form from the parts they make to allow for the shrinkage of the material (aluminium and iron have different shrinkage rates), new casting tools were required. Further to this, the finishing processes were different for aluminium panels and would need to be new. Also machining settings for aluminium are different from those for iron and so would require different arrangements. All these difficulties are real, not invented, as Chapman well knew. If new tooling was not made, the parts concerned would come out different from the heavier parts they replaced. The Ford engineers, thoroughly professional and trained to do everything by the book, took the view that they were required to make the lightweight parts to exactly the same dimensions as their original counterparts. Chapman argued, however, that it did not really matter if the parts were away from the original drawing provided they fulfilled their functions. This was a case of not being bounded by known limitations, an example of the experts ‘knowing what could not be done’. Even while accepting Chapman’s reasoning, the Ford people were not convinced that the normal tooling would work acceptably with the lighter and softer material. Chapman had to insist on actual trials being done. One part of Chapman’s specification was the vertical setting of the front wheels. This was to be achieved by lengthening the lower suspension link (in Ford terms the track control arm). The early drawings had shown this as a fabrication from sheet metal with blocks welded in for ball joint attachment etc. This construction was also used on the car provided for conversion as a prototype. A pair were duly modified by Lotus by cutting and re-welding – a process which they themselves regarded as highly unsatisfactory. The Aveley engineers were quite horrified that anything so nasty should be done to a safety critical component! Fortunately, however they were able to help, since they knew of a more recently designed forged version intended for heavy duty applications. This track control arm was very welcome to the Lotus team since they were already quite at home with reshaping forged parts. They had been using Standard/Triumph parts with re-formed steering arms ever since the Eleven. A jig was therefore made on which the forged track control arm could be fixed while the neck between the anti-roll bar fixing and the outer ball joint boss was heated and straightened slightly (even though the experts said you could not do it). Chapman had laid down 5.5 inch wheel rims for the new car. This width, on the 13 inch diameter of the Cortina wheel, was quite unknown to Ford, although Jaguar used it in 15 inch diameter. The Jaguar rim was of a thickness appropriate to the weight of their products but Chapman had specified much lighter 14 gauge (0.08 in). For the prototype, Dunlop, who made the Jaguar wheels, made up rims by cutting down some of these to the smaller size. In subsequent negotiations on the production rims, George Adams, then Dunlop’s chief designer and well known throughout the industry, simply refused to make rims that thin. A compromise was reached on 13 gauge. (A few years later, when the Mk 2 Lotus Cortina was to be made by Ford and they were to make the 1600E model using the same suspension, Ford remade the wheel with an even thicker rim again since the 13 gauge was still not robust enough by their standards). The first prototype car was used for a demonstration to the Ford management of the car’s potential, as a confirmation that the original promises were being fulfilled. This car started life as a 1200 cc two door Cortina. It had, of course, an all-steel body construction, but for the time being this was not important. In its reincarnation as a Lotus Cortina it was fitted out with two racing bucket seats, as used on the Lotus 18, mounted by a tubular steel frame to the normal seat runners, and trimmed to match the car interior in iridescent blue. A demonstration day was arranged at Silverstone which was rented exclusively for the purpose. The test day was a Monday, and as the car had been finished late on the Friday night, Lotus had two whole days to get on some miles. One of the known difficulties was that the Ford rear axle, designed years before for a much lower powered engine, simply could not stand the torque of the twin cam engine unless run in. It had been found in tests with the Anglia which had been used as a test bench, that a well run-in axle coped satisfactorily, but that one had done some 30,000 miles with an ordinary engine first. Ford was confident that production axles would be protected from new by special initial fill oil (not then available) and this proved to be the case. Several Ford directors and other senior managers were present for the demonstration and Jim Clark was there to drive. Chapman was there as was Mike Costin, then still part of the Lotus team. Of the Ford men present some were very much motor racing people, some even raced themselves. On the other hand some had no more contact with the sport than driving round theNorth Circular Road. Jim Clark had got in a few practice laps beforehand and, this being only about the second outing of this first Lotus Cortina, Chapman was most anxious to see how his theories were working out. Chapman also tried the car, turning in laps scarcely slower thanClarkand still better than the lap record of the time. Chapman felt that the car might be improved with a little more rear-end weight. He therefore tried a few laps sitting on the rear seat (with no seat belts) whileClarkdrove. When they stopped those present crowded round to get his impressions, which were that ‘He stays calm and keeps his foot down when I would have lifted off’. When the time came for the demonstration everyone stood around whileClarkdid his stuff and showed that Ford’s new toy could deliver better performances than previously possible for the racing class aimed at. At some point Chapman suggested that they might like to experience a few laps withClark. One or two of the Ford people volunteered and all of them looked somewhat shaken when they finished. One in particular, incidentally not a racing buff, remarked that he first wondered whenClarkwas going to stop accelerating – and then realised he was not. Cheshunt, more worried by the noise from the final drive gears which were by then loudly proclaiming the abuse they had suffered. One of Chapman’s stipulations was that the engine should be fed with cold air, rather than sucking in under-bonnet air. It is well known that an engine produces more power using cold air than warm and this is because the colder air has a higher density. This means that as the engine pulls in a fixed maximum volume of air it will get a larger quantity in this volume if the density is higher. The air brings with it a due quantity of fuel to produce the maximum power. Ford’s practice (as most other makers’) was to simply let the engine draw on under-bonnet air. This has the benefits of simplicity of installation and also means the engine will be more economical on the less dense warm air. Since the twin cam engine was fed by two twin choke Webers it was not entirely evident how to provide a cold air supply. On sports and racing cars it was usually easy to provide an opening in the bonnet to allow the air to flow in close ahead of the carburettors, but with this car that was not possible. In addition, open carburettors make a great deal of noise, so full intake silencing was needed. The solution was to provide a closed housing for the air intakes fed by a flexible pipe to the space ahead of the radiator. An air cleaner/silencer similar to the normal one was mounted in this area on its side. Much has been written in the specialist press about the reinforcing tubes in the boot space of the earlier Lotus Cortinas. The reason they came about is that Chapman did not realise the effect of the loads when he specified the rear suspension system. At this time he had no experience of the design and construction of this type of car body. The chassis-less construction of the modern car was of great interest to him as a lightweight structure and he had studied it at a distance. During the development of other products, notably the Elan, such structures were sometimes used as comparators for Lotus’ own performance at creating light and stiff frames. The Cortina shell was particularly light for that time and its overall figures of torsional stiffness were good. But knowing what might be called global facts such as these did not ensure that Chapman knew the details of how it was achieved. To make a structure light it is necessary to ensure that it is no stronger (i.e. heavier) than necessary. The structure that Ford had developed was not light by accident, but as a result of careful study of the loads involved and the way the structure resisted them. Semi-elliptic or ‘cart spring’ rear suspension systems support the vehicle at four points, the front and rear attachments of each spring. At each point there is an upward force on the body of about a quarter of the weight of the rear end of the car. What is more, the front of the spring pushes upward ahead of the axle, under the rear seats, while the rear of the spring pushes upward under the boot. Jimmy Allington’s drawing of the Lotus Cortina is of one of the production prototypes. Note the absence of rear end internal bracing. Also the A frame centre pivot is of the early threaded type. There is a spacer in the driveshaft also, which indicates a provisional design. Both of these places are exactly where support is needed since they are loaded areas. Ford’s body structure was designed taking the suspension system into account and therefore there was very little need for great beam strength over the rear axle. Indeed it is quite difficult to provide bending strength at this point since the structure is shallow – the underside rises over the axle and the upper profile comes down with the rear windscreen. Removing the four supporting points and replacing them with two, thrusting upward twice as hard, and at the weak point of the body away from the loaded areas, was guaranteed to create the most unfavourable situation possible. This is clear with the benefit of hindsight. But at the time, with minds preoccupied more with problems of handling on the one hand and of the logistics of the two firms working together on the other, this fact was missed. It was missed not only by Chapman, but also by his team and by the people at Ford, who were very experienced on this type of product. The points where the loads were applied to the body were, it is true, those strong points provided for shock absorber attachment. Shock absorber loads, however, are very different from suspension loads for two main reasons. Firstly, they are intermittent (on a smooth surface no force is transmitted at all) whereas suspension loads are present at all times. Secondly, shock absorber loads are generally lower in the upward direction than in the downward, due to the bias built into the dampers themselves, if anything, therefore, easing the bending loads induced in the body. The net result of this was of course that after a few road miles the tail of the body would start to droop under the combined effect of the concentrated upward load and the extra boot load of the large spare wheel and the battery. This droop showed itself on the outside of the car by the appearance of a ripple in the panel above the wheel arch. A possibly apocryphal story has it that when Chapman first saw these ripples he assumed someone had been using the car without permission and had damaged it. The Ford people though, recognized its true significance as a real problem and not just an isolated case of damage. Ford was very quick to come up with a drawing of the fix they could incorporate in the body during manufacture at Dagenham. To Lotus’ surprise, Ford proposed the tubular bracing which became a feature of the boot space until the suspension was revised after a year or so of production. Chapman was concerned at the outset of the project that because of its size and, more particularly, weight, the suspension frequencies were way above those he was used to dealing with. Suspension designers often use the frequency of the suspension as a means of comparing one with another. This is the bounce frequency of the vehicle on its springs – a softly sprung car has a low frequency and a high frequency gives a hard suspension (such as on a racing car of the last twenty years or so). At this time Chapman’s success in racing had been achieved with relatively soft (low frequency) springing. The softness that is possible is dependent upon the combination of the suspension movement available and the weight (more correctly, the mass) of the vehicle. Passenger cars, and the Cortina was typical, had a weight of perhaps three to four times that of the racing cars of the time, but the suspension movement is only about one and a half times greater. Thus the frequencies are inevitably higher by a factor of between two and three times. It was clearly out of the question to ask for an independent suspension at that time due to its cost and also to the fact that Ford would not have wanted to deviate so much from the initial design of their car for what was in effect publicity for it. So Chapman looked to his most successful previous live axle rear suspension system – that of the Lotus Seven. The difficulties of translating the radius arm and ‘A’ frame from a very light two seater to suit a full four seat saloon were considerable. The tubular frame of the Seven had been designed around the suspension and consequently had strongpoints where needed, the axle beam was very light and everything was therefore easy to make work reliably. Brackets to weld to the underbody reinforcements to anchor the ‘A’ frame were quite simple to conceive. The radius arms or upper suspension links could quite simply be designed to make use of the normal spring fixing points. If the attachments to the body were the easy part, things were harder in the design of the ‘A’ frame itself. Tube was used for its well known properties, and a size was chosen appropriate to the loads anticipated. The end fittings had to be made from robust forgings. Since the roll angles of the car were to be much greater than for the Seven, rubber joints were not considered suitable. For this reason a pivot was designed into the frame. For many years, as has been said, the front suspension upright from the Standard/Triumph small car ranges had been used on Lotuses. This upright had at its lower end a screw thread which served to carry the weight of the car and, turning within its threaded bronze lower trunnion, allowed for steering movement. On the Seven Series I and the Eleven there was a similar arrangement for the lower wishbone outer pivot, where the pin was threaded into steel bushes. This detail came from the Standard Eight and Ten of the 1950s. By the 1960s it had been replaced by a plain steel pin in plastic bearings. It was from this experience that Lotus drew in proposing the original threaded ‘A’ frame centre pivot. The concept, while quite sound in principle, had two drawbacks. Firstly, to work reliably over a lengthy period it would have had to be made with great precision in hard materials. Secondly, being a metal to metal bearing it transmitted noise and shock excessively. The design that replaced it was produced by Ford after these snags had been shown up in testing, but too late for incorporation at the outset of production. Ford’s new scheme tackled both of the above difficulties by using soft plastic bearings able to work with normal production tolerances. An interesting insight into Chapman’s thinking was, perhaps, that which involved the rear radius arms. On the Seven the radius arms were tubular and the rubber bushings allowed for the roll of the body. With the Lotus Cortina, as for the ‘A’ frame, more movement was demanded of the radius arms than could be afforded by the rubber bushes. 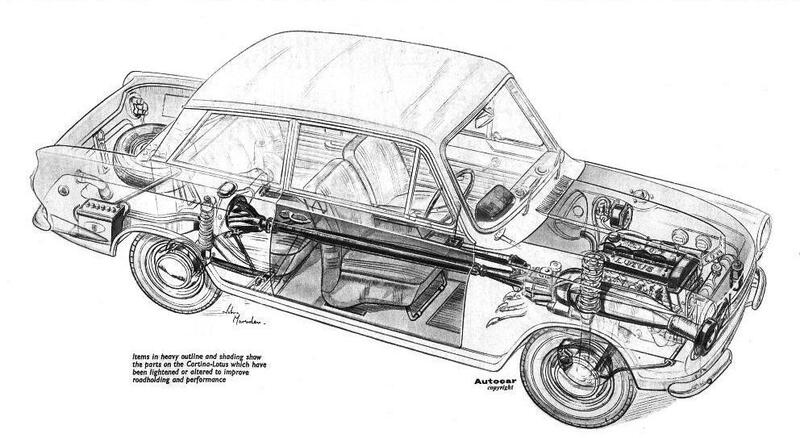 The Lotus Cortina radius arms had initially been drawn – following Chapman’s sketches – as made of tube. It was realised that they would be called upon to twist with body roll, which tube is not good at. The handling was therefore impaired by their torsional stiffness, which made them act like an anti-roll bar, causing unwanted weight transfer from the inner wheel on a corner to the outer. This had been noticed, remember, on the first test day. To allow an immediate test to be made before new radius arms were designed. Chapman suggested slitting the tubes lengthwise. Although this destroyed the torsional stiffness of the tubes as required for a test, it would have resulted in a drastically reduced service life had it been used in production. A circuit test showed that the traction of the car was improved as anticipated, which proved that the original problem had been correctly diagnosed and the design of some new radius arms in channel section steel was put in hand. The Lotus Cortina went on through one or two developments, including a divided drive shaft which greatly improved its smoothness of operation. When Ford introduced the MkII Cortina, however, they decided to terminate the sub-contract assembly carried out by Lotus and to bring the car to Dagenham, alongside the other variants. All in all, this project considerably advanced Lotus’ reputation in the eyes of a wider public and also gave the company valuable experience (and demonstrable success) with a different type of product. The later expansion into consulting could be said in some small way to be linked back to this time. Lotus also enjoyed a fairly stable income for quite a while without having to make much sales effort, since the company had the Ford dealer network working for it. This article is an extract from ‘Colin Chapman Lotus Engineering’ by Hugh Haskel. Osprey Automotive. A superb book and a must-have for any Lotus enthusiast.